A man has been arrested after he stabbed a garda, hijacked his jeep and went on the rampage in Cork Airport, hijacking a second vehicle. The man was overpowered at Cork Airport after he broke through the security fence there and rammed several vehicles. The man produced a knife to a garda who stopped him on Patrick St in Cork city centre at around 4.30pm. He slashed the garda across the face, hijacked his garda jeep and drove off, ramming several other vehicles and forcing terrified shoppers to dive for cover. He drove through the city centre, out the Southlink Road and up to Cork Airport, crashing through the security fence at the old terminal. The man then hijacked a Airport Emergency vehicle after he produced a knife to the driver. He rammed a garda car, injuring a garda inside. The garda's injuries are described as non life-threatening. 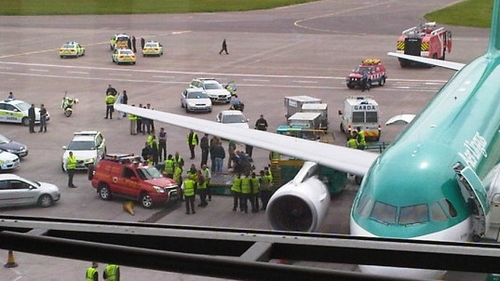 He was making his way towards an Aer Lingus plane which was boarding at the time when his vehicle broke down. The man was subdued and arrested. He is now being questioned at Togher Garda Station. The garda who was slashed in the face is described as being in a stable condition at Cork University Hospital.